NEW BEDFORD, Mass. 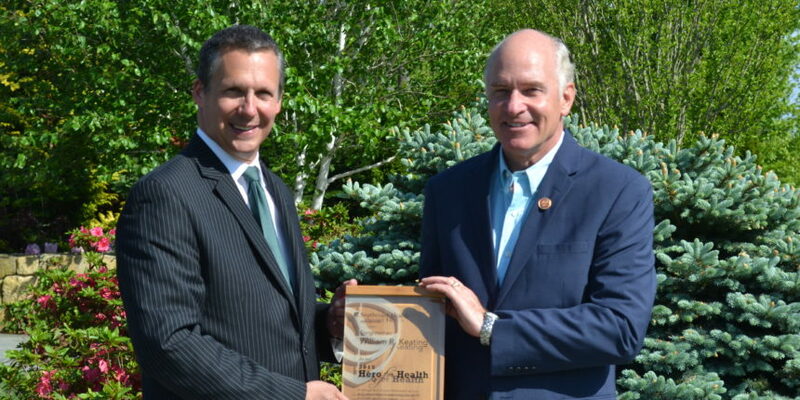 — Southcoast Health today announced that Congressman William Keating has been named the recipient of the 2015 Southcoast Health – Hero for Health Award. The Southcoast Health – Hero for Health Award is presented annually to an outstanding leader who exemplifies the mission of Southcoast Health by steadfastly fighting for and promoting the optimal health and wellness in our region, state and/or country. The award was presented to Congressman Keating on Friday, May 20. Congressman Keating has been a leader in the effort to combat the opioid epidemic, sponsoring legislation which promoted tamper-proof pharmaceuticals, increased access to drug take-back programs and the expansion of drug monitoring programs. In 2013, during the government shutdown, Congressman Keating worked with the Directors at the National Institutes of Health to prioritize access to essential treatments. He cosponsored the 21st Century Cures Act, federal legislation which increases funding for research related to modern treatments for diseases including cancer, diabetes, ALS and Alzheimer’s. He is a champion of the Veteran’s Choice Act, which increases access to healthcare for veterans, and fought against Medicare Disproportionate Share Hospital cuts, and reductions in the Medicare Area Wage Index. Congressman Keating served in the Massachusetts Legislature as a State Representative and State Senator from 1977 through 1999, and served as the District Attorney of Norfolk County from 1999 through 2011. He has represented the 9th Bristol Congressional District, which includes Fall River, New Bedford, Wareham, the South Shore and the Cape and Islands since 2011. He is currently a senior member on both the Foreign Affairs and Homeland Security House Committees. Past recipients of the Southcoast Health – Hero for Health Award include former Congressman Barney Frank (2012), State Representative Patricia Haddad (2013) and Bob Unger (2014), former editor and associate publisher at SouthCoast Media Group.